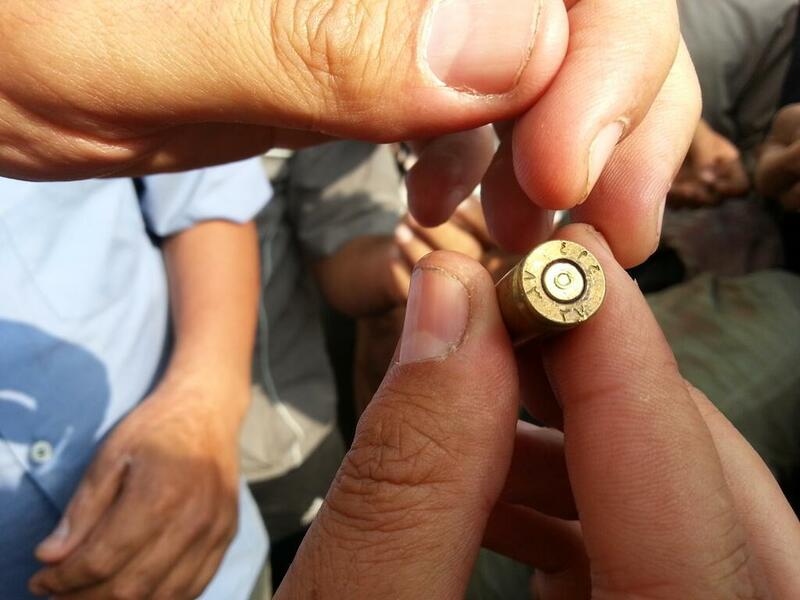 The image above is of a fired (spent) 7.62×39 cartridge case in the hands of a pro-Morsi protester in Egypt, as photographed by Louisa Loveluck earlier today. The cartridge is marked with the Arabic lettering for ‘A.R.E.’ at the 12 o’clock position, which stands for ‘Arab Republic of Egypt’, as seen on Egyptian ammunition produced from 1971 until present. Proceeding clockwise, there are the Arabic numerals for ’27’, referring to the Shoubra Company for Engineering Industries, often referred to by it’s military code, Factory 27. Finally, there are the Arabic numerals for ’83’, indicating that the cartridge was produced in 1983. The case itself is of brass alloy with a translucent maroon sealant at the primer annulus. The question posed was, essentially: ‘is there any way to link this to the military’? The answer, as is so often the case in this field, is ‘maybe’. 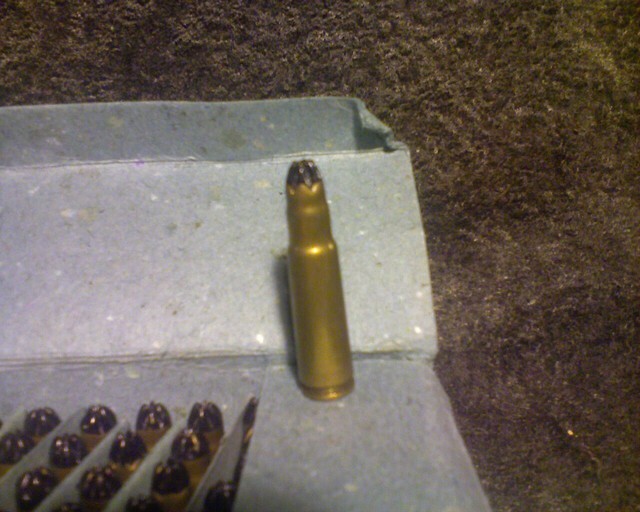 The cartridge pictured is indeed of Egyptian government production and consistent with ammunition that has been issued to the Egyptian armed forces. However, such ammunition has also been exported to several countries and has turned up in various conflict zones in the region. One such Factory 27 cartridge (in 9×19) was documented in my recent Small Arms Survey report on small arms ammunition observed in Libya. It is important to note, also, that internal controls in Egypt are weaker than in many other countries, especially given the upheavals of the past few years. The military does have a monopoly on production, and you would expect to see similar ammunition in the hands of the military, law enforcement, various armed groups and, in some cases, private citizens in Egypt. 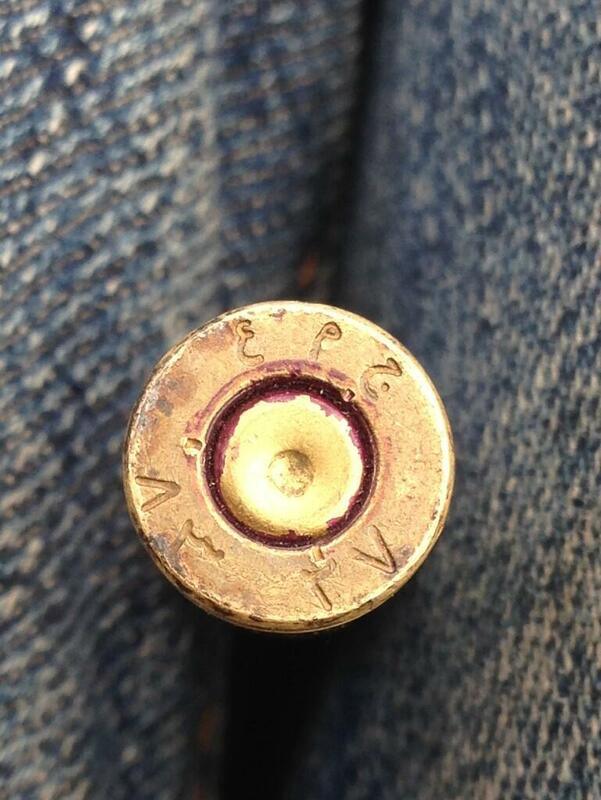 Update 08/07/2013: Jamal Elshayyal of Al Jazeera English has posted an image of another cartridge case with the same headstamp, pictured below. In this image, you can better see the maroon sealant at the primer annulus, and the three stake primer crimp. 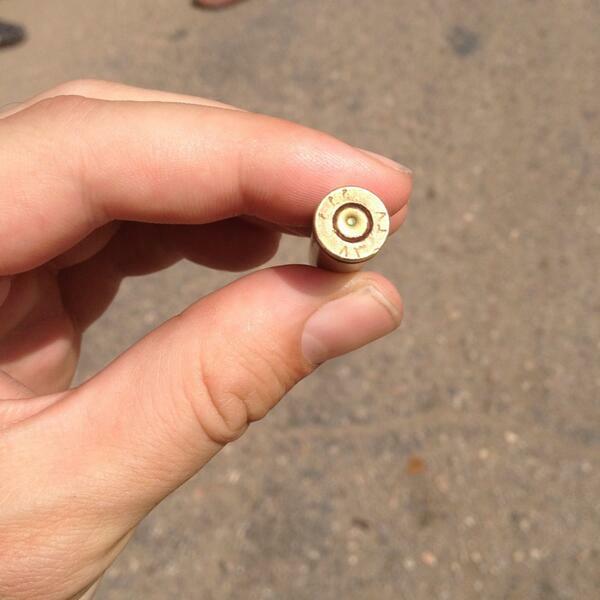 Jamal’s tweet describes the cartridge case as being from live cartridges “fired on pro-democracy protesters”. In the case of these Egyptian cartridges, however, it is not possible to tell the type of cartridge from the headstamp alone. 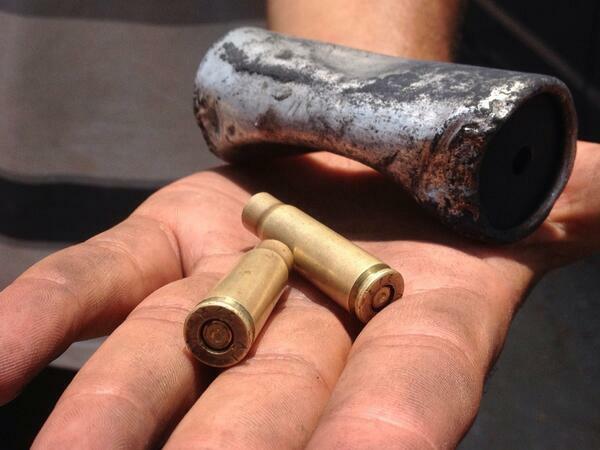 Update 10/07/2013: I have now been shown several more photographs (including two from Michael S. Lund, below) of cartridge cases retrieved by journalists, apparently from the same shooting incident. These cartridge cases are not from blank (or grenade launching) cartridges, as the Egyptian military and others have claimed. As I have mentioned, it is not possible to ascertain the projectile type from these cases alone, but there is a good chance they were FMJ (ball) rounds. The fact that all of the headstamps observed have been the same suggests a homogeneity of ammunition supply that is uncommon for many armed groups or private citizens. Julien Pain has also written on the use of live rounds during the protests for France 24. For those of you who have been asking how to identify a blank cartridge, I have include a photo of an Egyptian-made blank cartridge below. You can immediately see the difference in case dimensions when compared to a regular 7.62×39 cartridge (or fired case). Factory 27 does produce blank cartridges as well as other types in Egypt.